Canada is blessed with myriad aerospace companies leading the charge in a variety of capacities, yet some seem to operate under the radar, despite the fact they work on influential aircraft making their mark across the globe. In some ways, Fort Erie, Ont.-based Fleet Canada falls into this category, even though the company has been dutifully serving the aerospace industry for more than 85 years. Established in 1930 and sporting an impressive 500,000 sq. ft. manufacturing facility with a unique blend of old and new equipment, much of it handcrafted on site, Fleet specializes in detail fabrication, advanced composites, metal-to-metal bonding, and airframe assembly for a number of commercial, military and civil clients including Boeing, Airbus Helicopters, Bombardier, and Viking Air. With a highly-skilled workforce of some 160 employees, Fleet deftly understands the needs of its customers, and boasts an impressive history, creating some of the most influential and dynamic aircraft of its generation. (see, “Through the Years,” pg. 20). But Fleet’s current influence is still lost on some, perhaps due to a combination of the company’s location in Ontario’s Niagara Region, off the beaten track of bustling aerospace hubs in established Canadian cities such as Montreal, Vancouver, Winnipeg or the GTA. This “under the radar” persona is also reflective in part by a reinvention of the company in 2005, when Magellan Aerospace closed the facility and sold the assets to a local group led by current president/CEO Glenn Stansfield. A rejuvenated Fleet Canada opened its doors in February 2006 with 14 employees, all of whom were shareholders in the enterprise. And the company got straight to work with legacy work on the Bombardier Q-300 aircraft, which had been a staple of the old company for more than a decade. Other clients would soon follow. Today, Fleet focuses on four key programs and does each excessively well and is no longer tied to the Bombardier pipeline: supplying bonded wingskins, rear fuselage, tail plane and tail fin for Viking Canada’s Twin Otter; supporting the development of the new KC-46 tanker program for Boeing; manufacturing the front cockpit nose enclosure, pylons and platforms for the Boeing CH-47 Chinook; and working with a bevy of other clients on custom projects, components and more. A recent tour of the plant by Helicopters revealed a dedicated, talented – albeit lean – team that is clearly focused on its select projects, hardly giving off the sense that Fleet is obsolete in any way shape of form. As Fleet Canada’s business development manager Marika Kozachenko, explains, one of the best qualities of the company is its ability to focus on its strengths and offer clients capabilities and skillsets its competitors cannot. Call it the corollary of “state-of-the-art,” monolith organizations that mass-produce key components and parts. Being highly specialized and focused on a select group of programs enables Fleet to ensure quality is delivered at the highest levels. Each area of the 500,000 ft. manufacturing space, for example, is carefully organized and boasts highly-specialized techniques and processes. 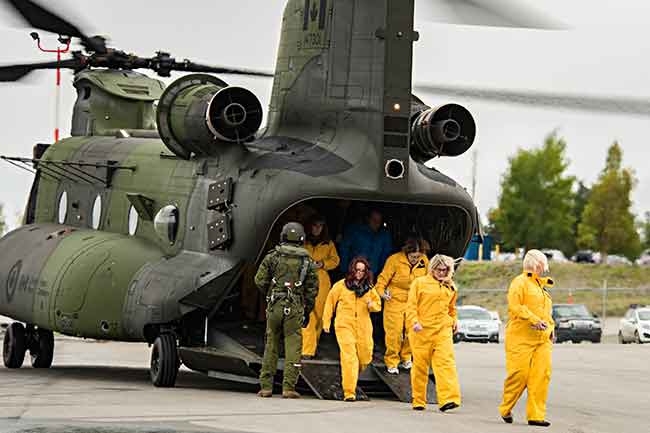 The production for the Chinook program is case in point. Handcrafted Chinook components are shipping at a rate of four to five per month, notes Kozachenko, which is a sound pace to ensure the highest integrity and precision. It also allows, with the pace of the other programs, time to scope out new business, which is always a key priority for the company. Boeing’s strong involvement, quality control and commitment also allows Fleet the opportunity to ensure high expectations are met, ensuring all international clients Boeing ships to are more than satisfied with the results. For the Twin Otter program, Fleet is making similar parts to what were designed in the 1960s. Much of that is still metal-to-metal bonding, a process Fleet specializes in. That process, certainly from a structural point of view, hasn’t been drastically altered since the 1960s. Fleet also specializes in the bonding of the wing skins for the Twin Otter, a process it has perfected and has no rival in the industry. The ongoing success of the aircraft on the international stage only bodes well for the company’s future fortunes. “Most of the Twin Otters that were built in the 1960s just keep going and going,” Kozachenko notes. “And they keep going up in value, which is also really wild. Because you would think that when you put something back in production, normal business math would say increased supply would lower the value . . . but it is not. They (Viking) are just doing a great job of getting people involved that are already supportive of the platform and know the platform. We are awfully proud to be on it and it talks about us, because this company has been given new life since the change and we too are having a rebirth. Which brings the discussion to the question of niche – what exactly is the one thing that differentiates Fleet from its competition? Coulaud is matter-of-fact when discussing the premise. It’s not about one thing – it’s a collective whole. This premise is reflected in the Fleet tour, one, which Coulaud says, is imperative potential clients experience. The commitment to craftsmanship and detail is evident at each section of the 500,000 sq. 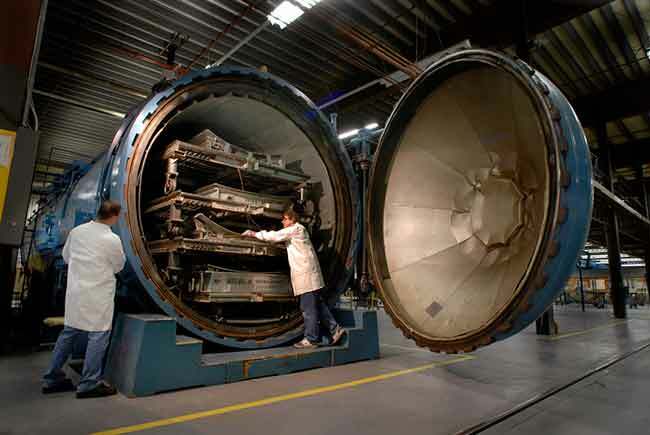 foot facility, be it in airframe assembly, composites bonding, chemical processing, surface finishing and more. Equally invaluable for Fleet clients are Fleet’s four NADCAP approvals for chemical processing, composites, heat treat and non-destructive testing. The fact Fleet can offer these processes in-house is another way customers can shorten and simplify their supply chains, offering more value. The ability to process in-house also improves efficiency and decreases transportation cost and administration required when outsourcing. “So, once again, it’s all quality control,” Moledina said. “NADCAP designations are not easy to get or to keep. But because of the wonderful site that we have and array of equipment and the strong quality assurance team, it makes them easier to keep up. After the 1980s, a lot of companies didn’t have a lot of processes under one roof. They went to the concept of specialization. We still have all of that under one roof. It’s all about being resourceful. And it’s also about understanding your customers and their product, where it needs to be supported and how. 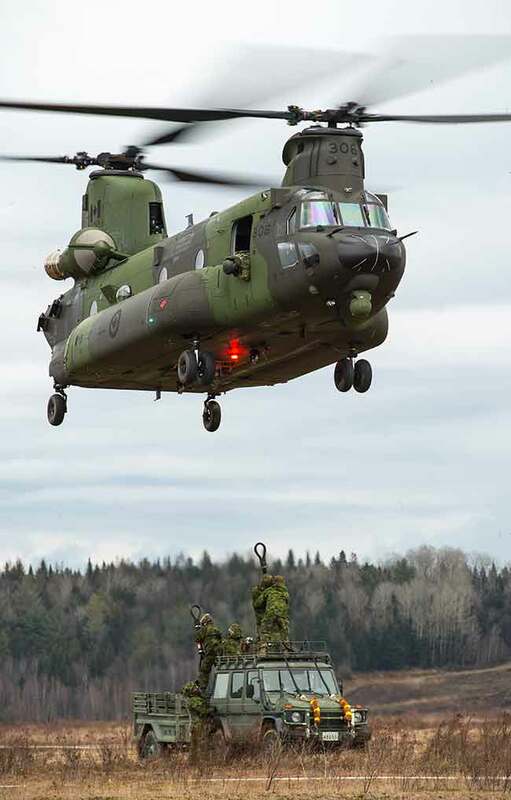 Fleet Canada makes parts for the Boeing CH-147 Chinook. Since Fleet is a small company with a small board of directors and a small management team, it also gives the company an advantage in making decisions on new business – it can carefully evaluate projects and business opportunities in a way other companies may not be able to. For example, Moledina notes a recent example of how “small and nimble” is a distinct advantage in evaluating potential deals. So, what are the future opportunities and potential growth areas for the company? With established manufacturing processes and skillsets coupled with solid clients and a well-run shop chalk full of experienced craftsmen, Fleet is in a good spot to look for growth opportunities. “We are looking for another good long-term customer – Boeing 767, Gulfstream or the Bombardier C-Series fits us well to become another business pillar,” Coulaud confides. Another golden nugget would be future work on the Boeing Super Hornet program, something that isn’t exactly out of the realm of possibility, especially if it is selected as a replacement to the aging CF-18s; Fleet already has a solid connection with Boeing and a lengthy list of Boeing approvals. As for now, Fleet will continue to do what it does best – concentrate on providing key components for some of the most iconic aircraft that frequent Canadian and international skies. Coulaud’s goal it to extend the legacy of Fleet Canada. “I am committed to growing this company; to keep good jobs in Niagara. We have all the ingredients here to be successful and I am so proud to tell people “We’re here and we’re ready”. Staying focused and doing what they do best continues to help a rejuvenated Fleet Canada make its mark in Canadian aerospace. 1930s – Reuben Hollis Fleet establishes Fleet Aircraft of Canada Ltd. on Gilmore Road in Fort Erie, Ont. on March 23, 1930 as part of Consolidated Aircraft Ltd. Fleet designs and constructs entire planes made of welded steel structures, covered by cloth with wood stringers. The War Years – Fleet Fawns, Finches and Forts became mainstays in the British Commonwealth Air Training Program. Fleet Canada produces more than 160 aircraft per month. Post War – Fleet designs the Canuck (Model 80) in 1939. The old trainers and Canucks were the perfect rugged aircraft to link remote areas across the globe through the new medium of flight. de Havilland designs the DHC-2 Beaver and Fleet is contracted to make fuselage panels and wing assemblies. 1950s – Fleet is contracted to supply components for radar antennas for Canadian General Electric to be installed in the Pine Tree line for NORAD in Canada. Fleet supports Canadian OEMs, including Avro’s CF-100, Canadair’s F86- Sabre Jet and de Havilland on the Beaver. Fleet is managed by Canadair from 1953-59. 1960s – In January of 1965, Fleet is awarded the job of building the flap and ailerons for the DC-9 for Douglas Aircraft. The plane becomes the MD-80, the program continues until the 1990s. 1970s – In 1973, Fleet become a division of RONYX Corporation Ltd. In 1977, Fleet designs 165 flight stations for the P-3C Orion/CP-40’s Aurora. 1980s – Fleet employees celebrate the company’s 50th anniversary in 1980 by restoring a Cornell, christening it “Sprit of Fleet II” and donating it to the Canadian Warplane Museum. 1990s – A new paint facility is completed in December 1990 with separate areas for complete aircraft and major components. The company is working for many of the world’s largest aerospace OEMs, and producing entire cabins for the Bell Model M230/430. In 1996, Fleet Industries is renamed Magellan Aerospace. 2000s – In August of 2001, a MODIG CNC machine is purchased to produce extruded detail parts. Magellan closes the facility in December 2005 and sells the assets to a local group led by Glenn Stansfield. The new company, Fleet Canada Ltd., reopens its doors in February 2006 with 14 employees, all of whom were shareholders in the enterprise. 2016 – Fleet is the only company to supply bonded wing skins for Viking Air’s Twin Otter. Fleet now supplies the wingskins, rear fuselage, tail plane and tail fin for the Twin Otter Series 400. Fleet Canada also manufacturers the front cockpit nose enclosure, pylons and platforms for the Boeing CH-47 Chinook helicopter and supports he development of the new Boeing KC-46 Tanker program.